Genki Japanese and Culture School (GenkiJACS) is an internationally acclaimed and accredited communicational Japanese language school that offers short-term study abroad courses, learning the Japanese language and culture in a relaxed and friendly environment. We are located in the heart of Fukuoka City, the biggest city in South Japan, more than 1000 km from the disaster zone in north-eastern Japan. GenkiJACS was nominated by popular vote as one of the world's top language schools every year from 2009 to 2011. We are one of only two Japanese language schools in the world that are accredited by IALC, the International Association of Language Centres, and the only one that focuses on Western students. We offer courses in a range of areas, including conversational Japanese, pop culture, Japanese culture, and study for exams, all with an emphasis on practical work, inside and outside of the classroom. For students coming from overseas to study abroad at our language school, we can prepare a range of accommodation options including homestays and dorms, and arrange various activities for the duration of your stay. We're here to make learning Japanese worthwhile and enjoyable - that's why students return to GenkiJACS again and again! GenkiJACS is not just your normal Japanese school. Classes are limited to a maximum of 7 students, and usually have around 3, giving you plenty of chance to practice with the teacher. 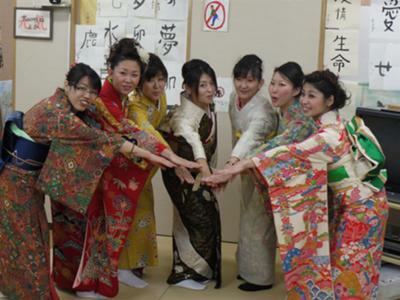 You won't find our "Japanese Plus Pop Culture" and "Japanese Plus Traditional Culture" courses at other schools! expert, or somewhere in between, we have a class for you. Multiple segments of each class means you're not stuck in a group with people much higher or lower than you. One of only two Japanese schools accredited by the International Association of Language Centres, and voted every year from 2009 to 2011 as one of the world's top language schools! Students return again and again. Unlike some other Japanese schools, all of GenkiJACS' teachers are graduates of a 420-hour Japanese teacher training course at a recognized study institution. We hire only the best, and perform regular training. Students agree: you won’t find better teachers! Courses start every Monday year-round, and you can study for as long as you want, from 2 weeks to a year or more! We schedule classes to fit your needs, instead of forcing you to learn when we want you to learn! Fukuoka City is the perfect place to study Japanese - one of Japan's biggest cities, with some of Japan's best weather and most beautiful beaches. A great combination! All levels of students are accepted, but beginners should be able to read hiragana. Depends on length of study - mail us for an estimate! Join in and write your own page! It's easy to do. How? Simply click here to return to Japanese Language School Directory.